Cook noodles in Dutch oven or large saucepan as directed on package. Drain; return to Dutch oven and cover to keep warm. Meanwhile, spray 12-inch nonstick skillet with nonstick cooking spray. Heat over medium-high heat until hot. Sprinkle pork strips with salt and pepper. Add pork and onions to skillet; cook 5 to 7 minutes or until pork is browned, stirring frequently. Add frozen vegetables, contents of pineapple pouch and frozen sauce from packet; mix well. Cover; cook an additional 7 to 10 minutes or until vegetables are crisp-tender, stirring frequently. Add cooked noodles; toss gently to coat. Cook and stir 2 to 3 minutes or until thoroughly heated. 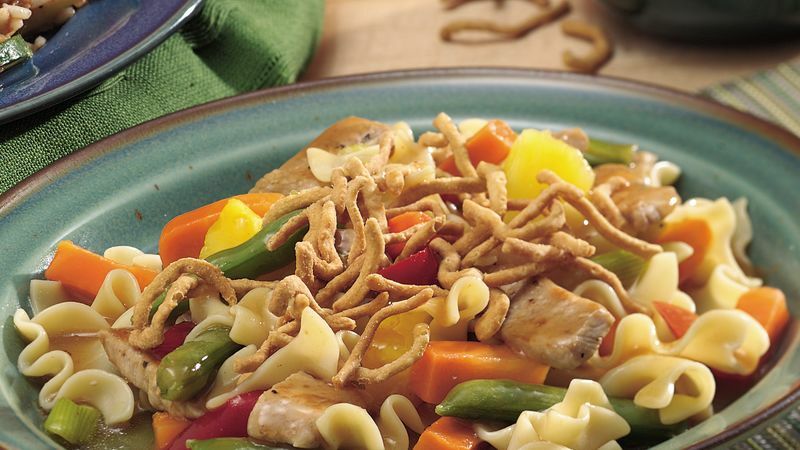 Serve topped with chow mein noodles. Serve lemon sherbet and fortune cookies for dessert. Use 1 pound of sliced chicken breast or turkey breast tenders in place of the pork. To make Teriyaki Pork Skillet, use package of frozen teriyaki stir fry meal starter, follow cooking time as directed on package.